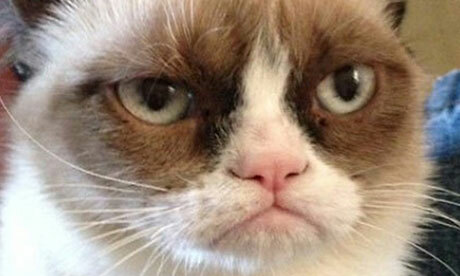 Queen of Mean Grumpy Cat to get own movie? Thread: Queen of Mean Grumpy Cat to get own movie? It is the news that will bring hope to Lil Bub, the goats that yell like humans and other wannabe meme film stars everywhere: Grumpy Cat, the moody feline queen of Facebook, looks set to get her very own movie. Deadline reports that the winner of the 2013 Meme of the Year gong at this year's Webby Awards is at the centre of a feature-film project being put together by her managers and Hollywood production company Broken Road. Grumpy, Tardar Sauce to her owners away from the cameras, will be given the power of speech and launched into a Garfield-style feature film. "This started off as a picture of a cat, but rare is an image that evokes that much comedy," said Todd Garner of Broken Road. "You read all of the memes and the comments, and one is funnier than the next. We think we can build a big family comedy around this character." Grumpy's appeal is hard to deny. The mixed-breed cat, whose moody facial expression is the result of dwarfism and an underbite, has more than 930,000 likes on her Facebook page and more than 120,000 YouTube subscribers. She was also named most influential cat of the year by MSNBC and most important meme of the year by Mashable in 2012. In March, Grumpy emerged as the surprise star of the SXSW film and music festival after her appearances drew thousands of people. There may be trouble ahead for filmgoers if the makers of Grumpy Cat: the Movie are basing their project on the dubious success of the Garfield films, however. Both 2004's Garfield: the Movie and 2006 sequel Garfield: A Tale of Two Kitties, featuring an apparently reluctant Bill Murray as the voice of the curmudgeonly cat, were widely panned. They did, however, take a combined $340m (£224m) at the global box office. I hope Grumpy Cat doesn't get too overworked and that she will be well-taken care of during the making of the film. I'll be watching this. The more people I encounter, the more I like my animals. MSNBC took the time to name a most influential cat of the year? I LOVE Grumpy Cat! It's probably the only meme I just never get tired of. She's precious! I will definitely watch any movie with her in it. And no, her owner is pretty strict about how much she can "work", plus the ASPCA will be all over the place. I highly doubt this baby will be worked too hard. I'mNotBitter, arie_skop, InigoMontoya and 1 others like this.